Maps Marker Pro v4.0-RC3 has just been released – thanks to all beta testers for your feedback & to all translators for the translation updates! This is the last planned release candidate – if no more blocker issues are reported, 4.0 final will be released next. Important: if you update from 4.0-beta1, 4.0-beta2 or 4.0-beta3, please manually deactivate and activate 4.0-RC3 once after the update on the plugins page, so that the new capability system gets initiated! To avoid loss of data, please do not use beta versions for production sites and do not delete version 3.1.1 until 4.0 has been released, as more fundamental changes might be necessary! In addition we recommend to backup your site (especially the database) regularly so in case of an issue with this beta release you can always perform a full rollback if needed! As next step click on the link “Update now” to update to v3.1.1-RC1. As next step, click on “Start migration” (to migrate your map data from the old to the new database schema). 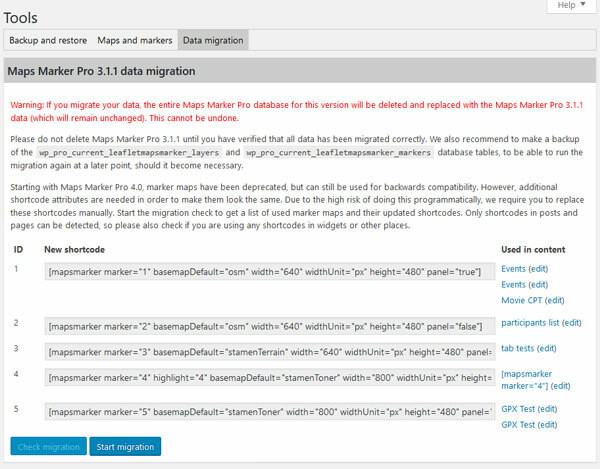 Please do not delete Maps Marker Pro 3.1.1 until you have verified that all data has been migrated correctly. We also recommend to make a backup of the wp_current_leafletmapsmarker_layers and wp_current_leafletmapsmarker_markers database tables, to be able to run the migration again at a later point, should it become necessary. That´s it – now you can start using Maps Marker Pro v4.0-RC3. For directly downloading and installing the v4.0-RC3 package as zip file, please click here. For an archive of all available releases, please click here. If you want to use v3.1.1-RC1 again, please first deactivate Maps Marker Pro v4.0-RC3 and then activate Maps Marker Pro v3.1.1-RC1 again. 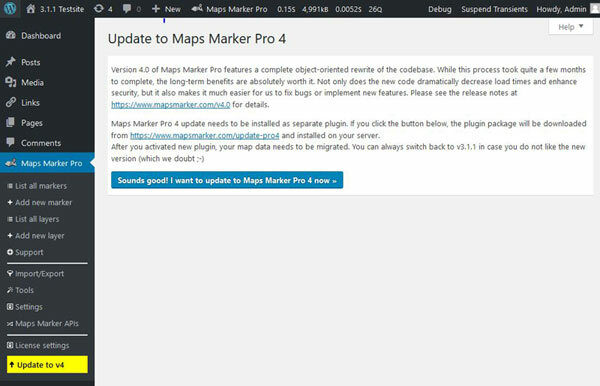 Please be aware that any maps which have been created with Maps Marker Prov 4.0-RC3 will not be visible with Maps Marker Pro v3.1.1-RC1, as a complete new database schema is used!